Shin splints are a common exercise-related problem. 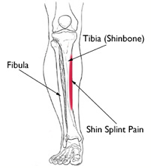 The term “shin splints” refers to pain along the inner edge of the shinbone (tibia). Shin splints, known as Medial Tibial Stress Syndrome, are an inflammation of the muscles, tendons and bone tissue around your tibia. Pain typically occurs along the inner border of the tibia, where muscles attach to the bone. Shin splints typically develop after physical activity. They are often associated with running, however any vigorous sports activity can bring on shin splints, especially when a new fitness program is started. Shin splints develop when the muscle and bone tissue (periosteum) in the leg become overworked by repetitive activity. In most cases, shin splint occur after sudden changes in physical activity such as frequency of the number of days you exercise each week. Changes in duration and intensity, such as running increased distances or increased vertical resistance, can also cause shin splints. Flat feet, abnormally rigid arches and improper footwear can contribute to shin splints. Non-steroidal anti-inflammatory medicines. Drugs like ibuprofen, aspirin and naproxen reduce pain and swelling. Wear a proper fitting athletic shoe. To get the right fit, determine the shape of your foot using the “wet test.” Step out of the shower onto a surface that will show your footprint, like a brown paper bag. If you have a flat foot, you will see an impression of your whole foot on the paper. If you have a high arch, you will only see the ball and heel of your foot. When shopping, look for athletic shoes that match your particular foot pattern. Slowly build your fitness level. Increase the duration, intensity and frequency of your exercise regimen gradually. Like any significant change in your fitness regimen, a barefoot running program should be started very gradually. Begin with short distances to give your muscles and your feet time to adjust. Pushing too far, too fast can put you at risk for stress injuries. In addition, barefoot runners are at increased risk for cuts and bruises on their feet. Several brands of minimalist shoes with “toes” are available and these also require a slow working in period as your body adjusts to this different activity.